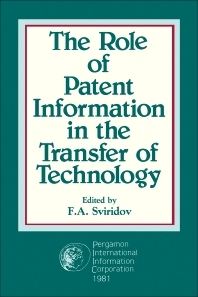 The Role of Patent Information in the Transfer of Technology is a compendium of papers presented at the International Symposium on The Role of Patent Information in the Transfer of Technology. The symposium is organized by the State Committee for Science and Technological Progress of the People's Republic of Bulgaria, in cooperation with the World Intellectual Property Organization. The collection is composed of papers written by the delegates of the symposium that seek to highlight the usefulness of patent information in the transfer of technology. The focus is to find ways and means to facilitate the transfer of technology, primarily from the industrialized countries to the developing countries. The text emphasized that such an undertaking has the potential for global industrial, technological, scientific, and economic development. The book is essentially devoted to the exposition of two main points; the role and importance of patent information and technology transfer in industrialized nations; socialist states and developing countries and patent documentation and information dissemination. Inventors, scientists, economists, industrialists, engineers, market analysts, and students will find this text interesting. WIPO: An International Register for Computer Programs?